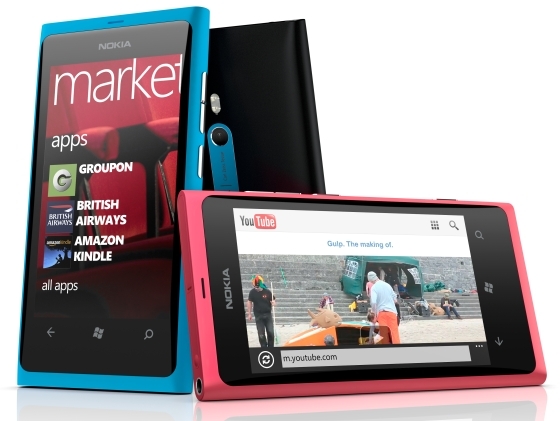 It adopts a unibody design being manufactured same as N9, from one piece of polycarbonate. The finishes are impeccable. It gives you the impression of quality and pleasant feeling. The screen is inserted perfectly and the reactions obtained when the phone is seen for the first time are of astonishment. You do not have access to the battery. The impression given is of solidity without compromising quality. It has 142 grams and 12.1 mm thick. It has a 3.7 inch screen with AMOLED technology with resolution of 480 x 800 pixels and 16 million colors. It also brings wide viewing angles and it is superior to S-LCD found on other smartphones with Windows Phone. The sound comes from a speaker placed laterally and when you will keep this phone on landscape mode you will might obstruct the sound. It sounds clear and loud. The 3.5 mm jack is disposed on the upper side of the phone. The headphones that come with the Lumia 800 are classic, round and black. It is one of the most powerful phones with Windows Phone 7.5 Mango. It brings a single core processor clocked at 1.4 GHz, 512 MB RAM and 16 GB of storage without a microSD slot. The 16 GB should be enough for downloading few movies and thousands of songs or documents. The hardware part counts, but the most important things are the optimizations made by Microsoft on its operating system. The experience offered is smooth and without reproach. It runs Windows Phone version 7.5 or Mango. It comes from the factory with this software. There are several additional applications such as Nokia Drive. Windows Phone 7 Marketplace offers over 40,000 applications and Microsoft strive to create a wider community of developers for its mobile operating system. It brings Wi-Fi b/g/n, 3G with download speeds up to 14.4 Mbps, Bluetooth 2.1, microUSB and a 3.5 mm jack. The GPS is also included. The microUSB port is positioned on the upper side of the phone and it is protected by a plastic cover. Next to the microUSB port with role of charging you will find the MicroSIM card slot. On the right side you will the buttons for volume and one for start and stop the phone but also the buttons for fast lock and unlock the touch display. Carl Zeiss has become a kind of standard of quality that Nokia always counts on its high-end phones. It brings an 8 Megapixel sensor that shoots HD at 30 fps with continuous autofocus. It integrates a dual LED flash which is strong enough.